2010 | acc, fiddle x 2, vla, vcl, scottish hp, gt | 8'58"
As Water Wears The Rock is a piece for seven instruments plus tape part. 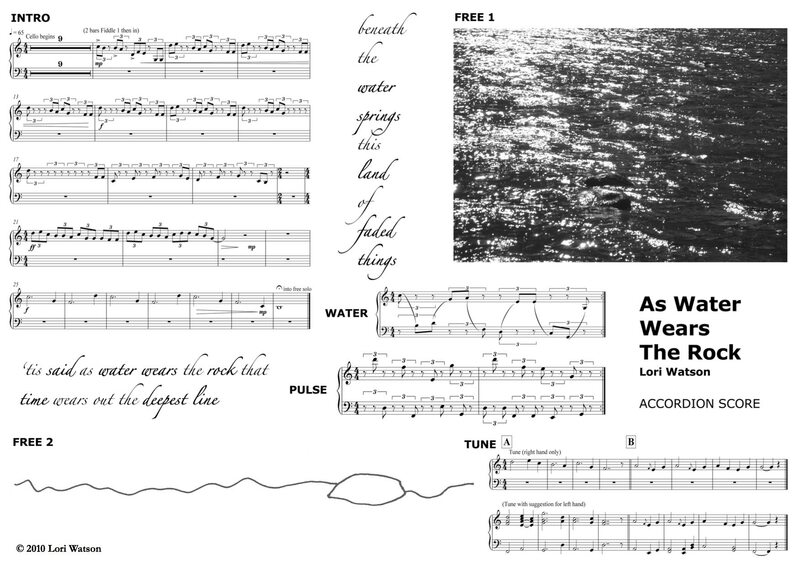 It consists of seven graphic scores, one for each instrument part, and an atmosphere recording. The scores were composed in relation to my experiences of St Mary’s Loch and draw on the writing of James Hogg and the wider themes of the passing of time and loss. The scores feature images, text and standard notation. The atmosphere recording was made at St Mary’s Loch in 2010. 2009 version available for Accordion and string quintet.